ASDES has secured a free opportunity with the Down to Earth Project on the Gower. Down to Earth is responsible for building a training centre on its site near Llanrhidian SA3 1ED. The project positively engages community groups to develop skills in working with others along with a variety of practical skills. The process uses sustainable methods (minimal damage to the environment) to construct buildings, in doing this the tasks can be broken down so everyone can engage. These are some of the images from the Down to Earth website that give you an idea of the tasks involved. 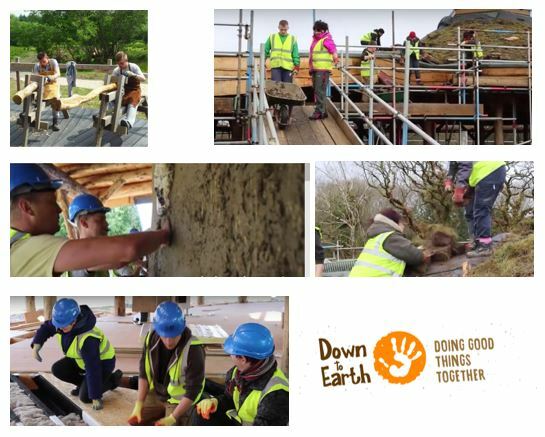 Judith has worked on this project alongside a number of participants who have been able to engage in a range of activities including mud plastering walls, turfing a roof, building walls out of straw and insulating a floor with sheep wool. All tasks are manageable for ASDES participants and if the tasks cause anxiety then an alternative will be found. This is a fun activity, there is no pressure to complete a set amount of work, Down to Earth has an excellent ethos of doing what the individual feels is right. ASDES job coaches will be present throughout the sessions. Down to Earth provides all the personal protective clothing and equipment, there is a facility for breaks and when the weather is not pleasant indoor tasks are developed.